Today, Mayor Jim Watson announced the first Mayor’s Gala for the Arts, an event to celebrate, support and grow Ottawa’s artistic and cultural scene. He was joined by Ottawa Arts Council Executive Director Peter Honeywell and Ottawa Art Gallery Director and CEO Alexandra Badzak. This unique dinner reception and artistic experience will showcase the vibrancy of Ottawa’s local arts community. It is an opportunity for the community to come together and celebrate the achievements of Ottawa’s local artists, while supporting the upcoming talent of tomorrow. “Ottawa is a city of artists and innovators; of spectators and celebrations,” said Mayor Jim Watson. “The Gala will create a stage on which Ottawa’s artists and innovators can occupy the forefront, and elevate our City’s artistic scene. Together, let’s Fall for the Arts”. “The Mayor’s Gala for the Arts will help to elevate our project partners by bringing broader engagement and increased resources,” said Peter Honeywell, Executive Director, Ottawa Arts Council. “The Mayor’s support of the OAG Expansion and Arts Court Redevelopment project is fundamental. 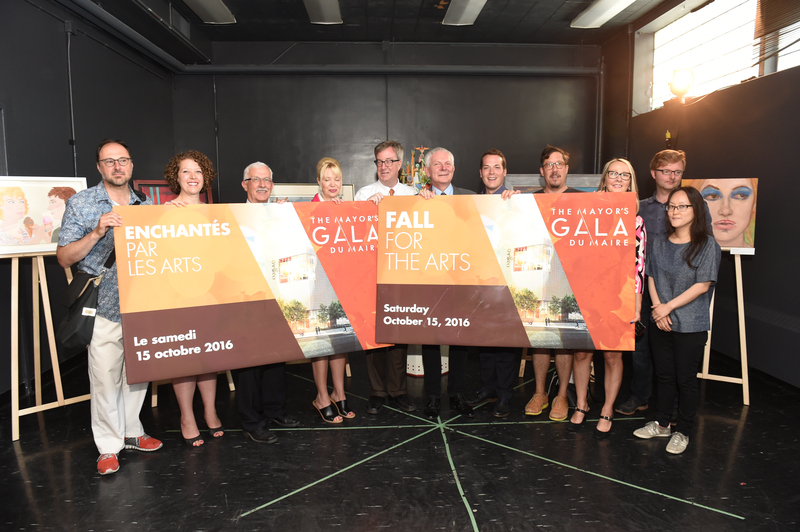 Not only has the City assembled an exceptional team to lead design and construction on the project, the Mayor’s Gala will further our shared goals of building excitement and community support for the most important facility development project for the arts in Ottawa’s history- a true 2017 legacy!”, said Alexandra Badzak, Director and CEO, Ottawa Art Gallery. Mayor Watson also announced that CF Rideau Centre and the Downtown Rideau BIA will partner as the title sponsor of the Mayor’s inaugural gala for the arts. Mayor Watson added that “This investment by CF Rideau Centre and the Downtown Rideau BIA in the Mayor’s Gala for the Arts is a major vote of confidence in the future of Downtown Rideau as the heart of Ottawa’s Arts, Fashion & Theatre District”. The inaugural Gala will take place on Saturday, October 15, 2016 at 7:00 p.m. in the Horticulture Building at Lansdowne Park. The proceeds will be directed to the Ottawa Art Gallery Expansion and Arts Court Redevelopment Project, which is currently under construction. Click here to purchase your ticket. Together, let’s Fall for the Arts.